Installing Enterprise Browser on a desktop or laptop system provides all the software necessary to start making Enterprise Browser apps. All that's needed in addition to the software is a connection via Android Debug Bridge (ADB) or Microsoft Mobile Device Center (or ActiveSync on WinXP) to one or more supported Zebra devices running Android or Windows Mobile/CE. See the Prerequisites section for connection details. Windows is required for full Enterprise Browser development. For Mac OS X users, Enterprise Browser 1.3 and higher can be downloaded as a disk image (.dmg), allowing a subset of administrative functions listed below. Note: Microsoft Mobile Device Center replaced ActiveSync starting with Windows Vista. It is usually included with the operating system, but sometimes must be downloaded separately. 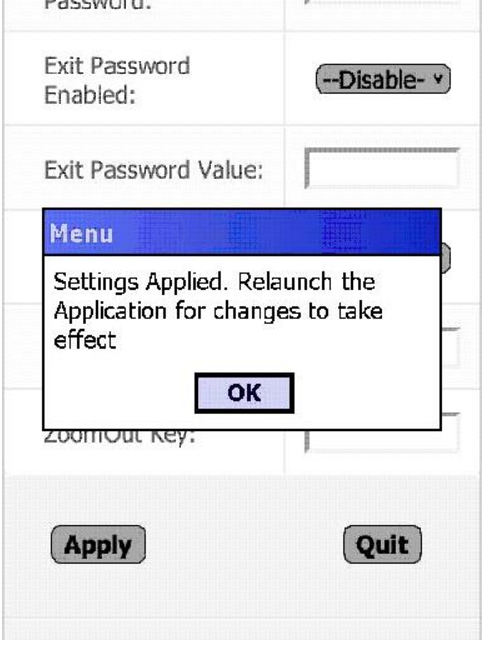 Installation of Enterprise Browser from Windows XP systems requires ActiveSync. 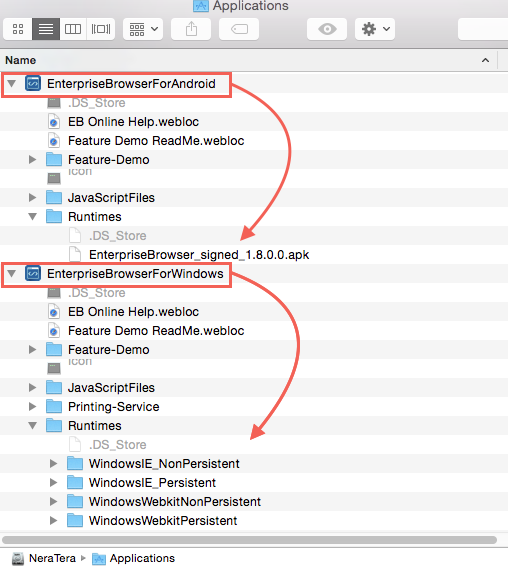 When Enterprise Browser is uninstalled from an Android device using the Android Application Manager, EB and its related components will under most circumstances be removed properly. Known exceptions are listed below. TC55 Jelly Bean - If Enterprise Browser is installed onto the device's internal memory, files will not be removed by the Uninstall function of App Manager. Installation onto an external SD Card works normally. MC32 Jelly Bean - If Enterprise Browser is installed onto the device's internal memory, files will not be removed by the Uninstall function of App Manager. Installation onto an external SD Card works normally. Zebra recommends that uninstallation be verified for each device scenario before any process is automated using StageNow or an MDM system. 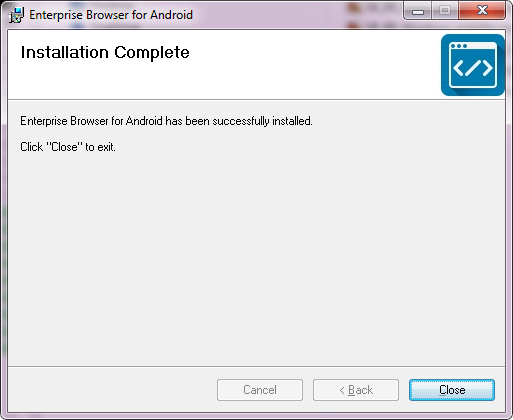 This section describes installation of the "Enterprise Browser for Android" deployment tool on a Windows PC. The installation process is similar for "Enterprise Browser for Windows," which is used to deploy EB to devices running Windows Mobile/CE. 1. If upgrading, back up any data stored in the C:\EnterpriseBrowser directory of the host PC. 2. Visit the Enterprise Browser download page and scroll to find the download for the desired target platform (Android or Windows Mobile/CE). About download package contents. 3. When the download completes, launch the installer(s) and follow the prompts to install. After installation, a screen appears similar to the image below. Click "Close" to quit the installer. The Enterprise Browser deployment tool appears in a window similar to one of the images below (depending on the platform being targeted). 5. Select one of the available platform runtimes to display its description. Instructions continue in the Deployment to Device(s) section, below. 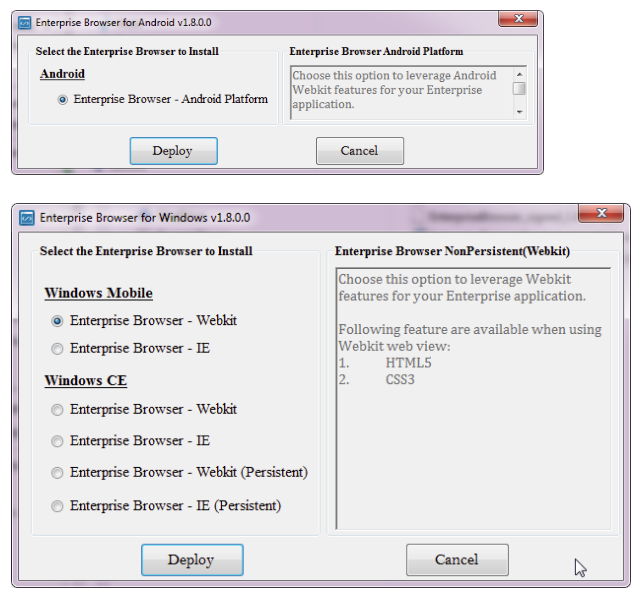 Visit the Enterprise Browser download page and click on the desired EB version. The corresponding installation packages for Windows and Mac OS X appear. a. Click on the desired Mac OS X .dmg package(s). b. Accept the end-user license agreement to begin the download. When the download completes, double-click the .dmg file to open it. Depending on the target platform, a window similar to the images below appear. Files in the "Runtimes" folder (red arrows) correspond with those deployed by the Android or Windows Mobile/CE installers for Windows PCs. These are the same runtimes as those listed on the left side of the "Installer" screens. On Windows host systems, communication from the host to target device(s) is handled by the Android Debug Bridge (ADB) for Android devices and by Mobile Device Center (or ActiveSync on WinXP) for Windows Mobile/CE. It also might be necessary to install an OEM USB driver to make a USB-attached Android device visible to Windows. 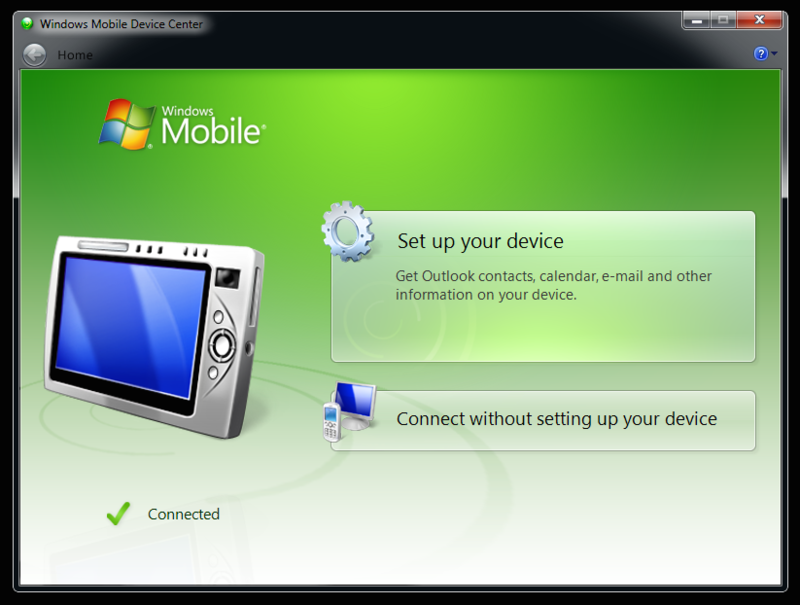 If the device isn't visible to Windows, refer to the Connections section, below. 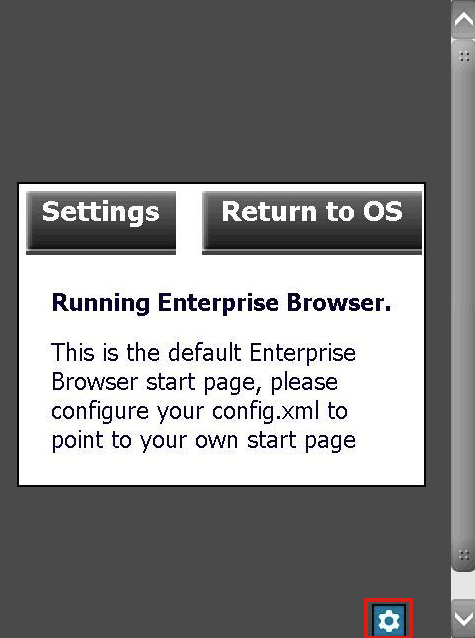 Select Start -> Enterprise Browser -> Enterprise Browser Installer to bring up the EB Installer. A window will appear similar to the image above. Select the platform that matches the device, OS and webview being targeted. Information in the right-hand pane will vary according to the selection. Click "Deploy" and follow prompts. A window will appear similar to the image below. Restart the device to complete the installation. 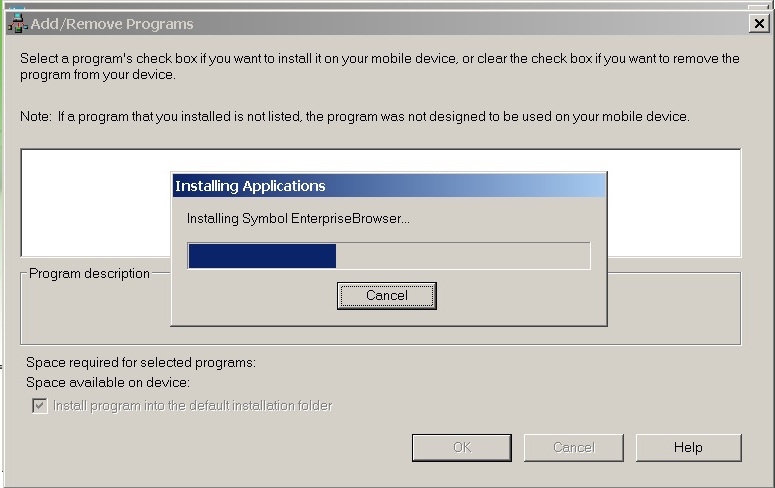 Note: For persistent installations on Windows CE (the lowermost two options on the "Installer" screen above), a cold boot/cleanPS (clean persistent storage) is required to complete the installation. Note: Prior to installation, some Windows devices might prompt for the installation location on the device. 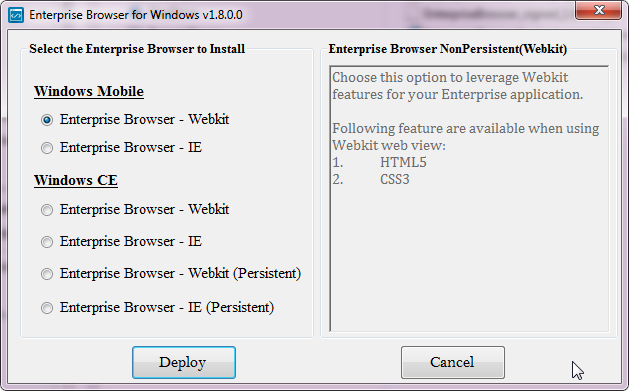 Enterprise Browser overrides any selection made here; it will always be installed in \Program Files\EnterpriseBrowser\. The preferred deployment method of Enterprise Browser runtimes from a Mac OS host system to Android target devices is with the Android File Transfer utility. If Android File Transfer is already installed, skip to Step 5. 1. Visit the Android File Transfer page. 2. Download and open the Android File Transfer .dmg file. 3. 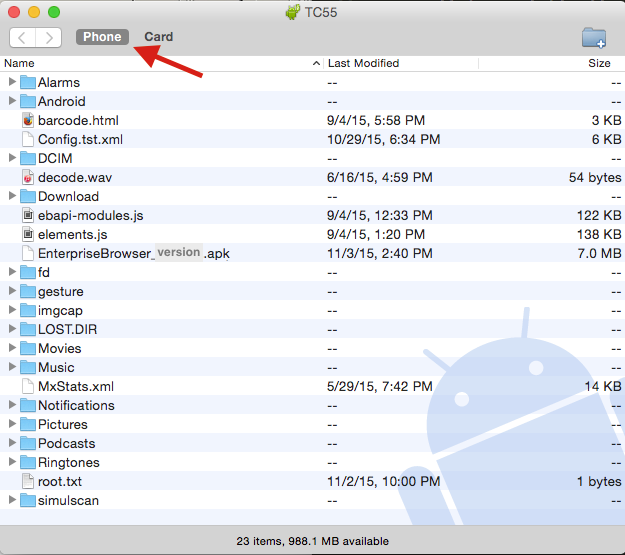 Drag the Android File Transfer app into the Applications folder on the host Mac. 4. Plug in the Android target device and unlock the screen. The device file system should automatically appear on the Mac in a window similar to the image below (It's sometimes necessary to launch the app manually.). 5. Copy the Enterprise Browser runtime for Android to internal storage, which is opened by default. Storage buttons (red arrow) will be shown only if an additional storage card is present in the device. Note: All connected devices must be unlocked before any file transfers can be performed. 6. Using the File Browser app on the device, navigate to and execute the runtime to unpackage its files and directories. 7. Restart the device to complete the installation. 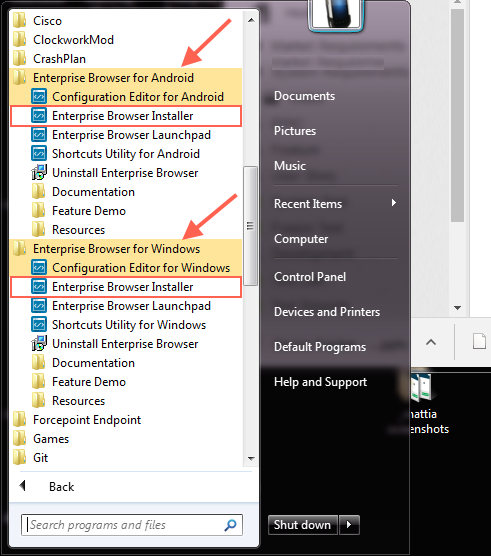 Refer to the On-device Configuration guide for help configuring Enterprise Browser following installation. The preferred deployment method of Enterprise Browser runtimes from a Mac OS host system to Windows Mobile/CE devices is using Bluetooth. 1. Set the Windows Mobile/CE device as discoverable in the MotoBTUI app. 2. 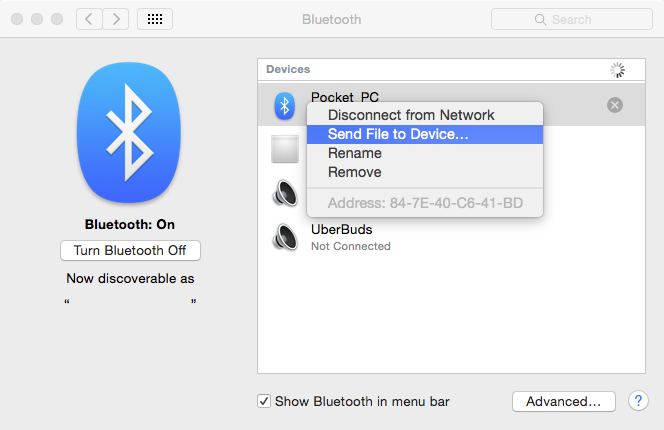 Pair the device with the Mac using the Mac's Bluetooth Preferences panel. Enter pairing code and follow additional prompts as necessary. 3. Right-click the newly paired device and select "Send File to Device..." (as below). 4. A file dialog will appear. Navigate to and select the Enterprise Browser runtime to be deployed to the WM/CE device and click Send. 5. When the transfer is complete, tap "Yes" on the device to save the file. 6. Using the File Explorer app, navigate to and execute the runtime to unpackage its files and directories. Note: Copy Enterprise Browser Runtimes to internal storage only. Visit the Zebra Support Portal, download and install the latest driver from the list. For non-Zebra hardware, visit Google’s OEM USB Driver page for instructions and links to OEM drivers for the brand of device. Visit the Android Developer Tools page, download and install the Android SDK to match the system (Mac OS X, Linux or Windows 32/64). Add the full path to adb.exe to the system path. The EB installer and its utilities use adb to push files to Android devices. 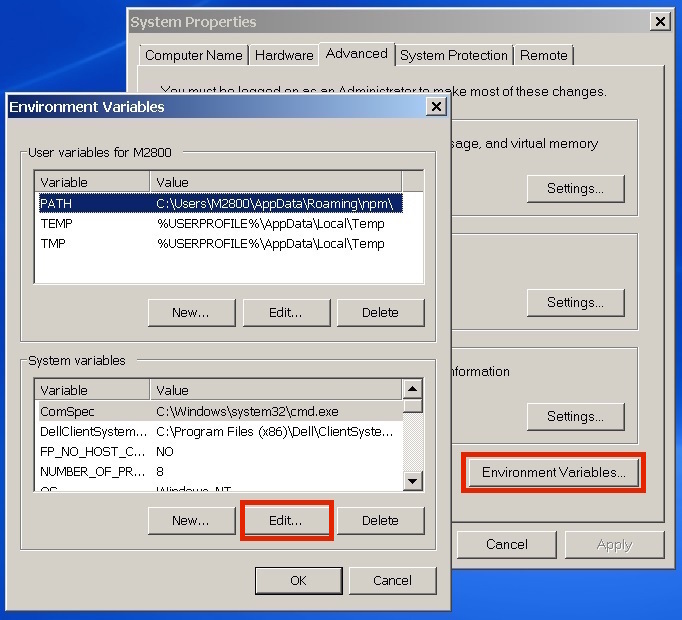 Since its location could vary with any given system, the path to adb.exe must be available system-wide so that EB can simply execute "abd.exe" rather than repeating the explicit path with every push function. In the LOWER window, scroll down to "Path"
Add a semicolon (;) to the end of the line followed by the path to "abd.exe"
The system is now ready to deploy Enterprise Browser apps and shortcuts to an Android device. If no such prompt appears, go to Device Manager and select Action -> "Scan for hardware changes" When USB drivers are installed correctly, a box like the image below will appear. Note: If Windows doesn't recognize a devices connected to a USB 3.0 port, try connecting it to a USB 2.0 port. 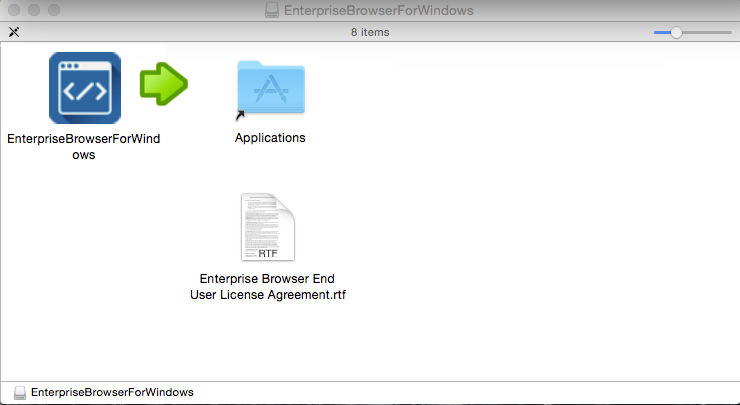 The system is now ready to deploy Enterprise Browser using the Enterprise Browser installer. Enterprise Browser runtimes can be individually pushed to devices from Windows or Mac OS X machines and manually unpackaged on the device. After installing the Enterprise Browser (.msi or .dmg) executables on the development host as above, perform the steps below as appropriate for the target platform. Enterprise Browser also can be mass-deployed using Zebra StageNow or a compatible MDM system. See the Mass Deployment section. Locate the Enterprise Browser runtime files on the installation host. This process varies from Windows and Mac OS X and hosts. Both are exaplained below. Note the separate folders for different target platforms. 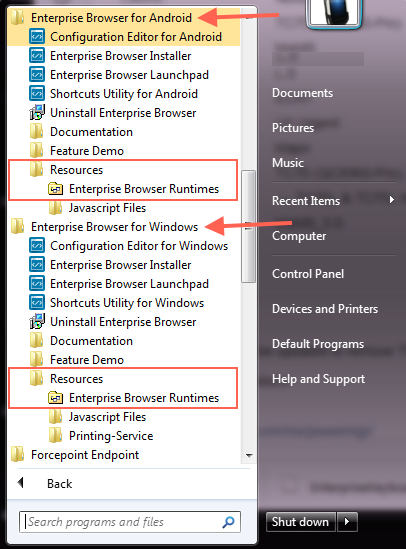 Go to Start Menu -> Enterprise Browser -> Resources ->Enterprise Browser Runtimes. In Enterprise Browser for Windows, the "Runtimes" folder looks similar to the image below. The runtimes folder of EB for Android (not shown) contains just a single .apk file. 1. After locating the desired runtime using the procedures above, drag-copy the runtime to the root directory of the device. 2. For versions prior to Enterprise Browser 1.5, skip to Step 5. On Enterprise Browser 1.5 and higher for Android, a pre-configured Config.xml file (and optionally a keycodemapping.xml file) can be copied to the device at /<internal_mem_root_dir>/EnterpriseBrowser/ at this time (create the directory, if necessary). 4. Reboot the device to complete the installation. On persistent installations, a cold boot/cleanPS is required to activate the runtime. Note: Directory names are case sensitive. Applies only to Enterprise Browser 1.5 (and higher) for Android. After Enterprise Browser is launched for the first time following installation, subsequent launches still check the /<internal_mem_root_dir>/EnterpriseBrowser/ directory for new versions of the Config.xml and/or keycodemapping.xml files for processing as described above. Therefore, new versions of those settings files should be placed in the /<internal_mem_root_dir>/EnterpriseBrowser/ directory. The next time Enterprise Browser is restarted, copies of the new settings file(s) will automatically be placed in the appropriate locations for execution and backup, and the original(s) will be deleted. 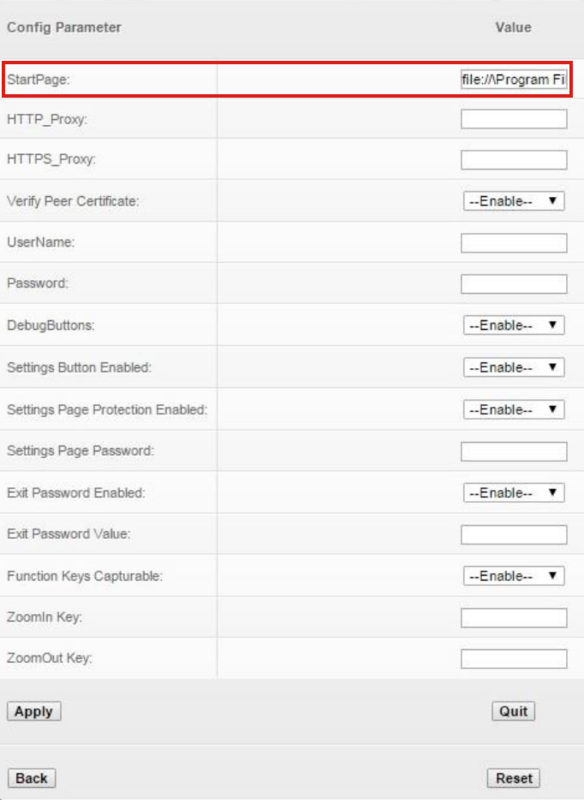 The Enterprise Browser runtimes and configuration and licensing files can be deployed to one or more devices using Zebra StageNow or an MDM system by using the instructions below. 2. Copy the desired runtime file to the MDM system, and configure the system to push the file to the root directory of the device. For versions prior to Enterprise Browser 1.5, skip to Step 4. On Enterprise Browser 1.5 and higher for Android, a pre-configured Config.xml file (and optionally a keycodemapping.xml file) can be copied into the /<internal_mem_root_dir>/EnterpriseBrowser/ directory on the device. at this time (create the directory, if necessary). Note: If deploying config files, it's critical that the MDM be configured to execute Step 3 prior to Step 4. Otherwise, the config files will not be activated by this process. 5. Reboot the device to complete the installation. On persistent installations, a cold boot/cleanPS is required to activate the runtime. 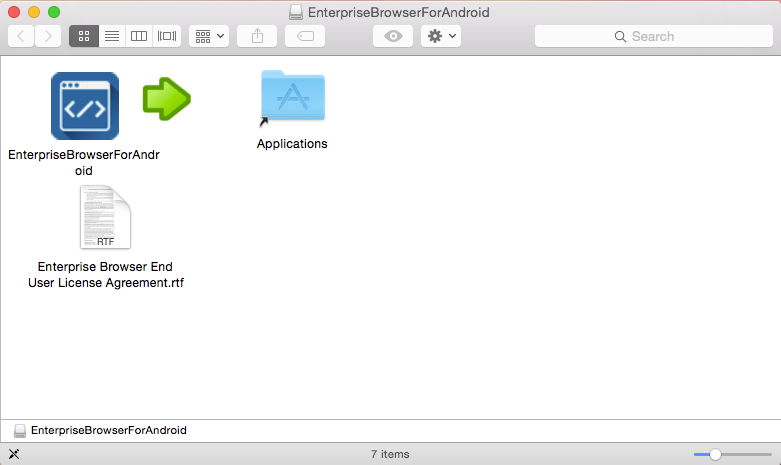 After installation and first launch, an Enterprise Browser app icon will appear in the all-apps section or "App Drawer" of Android devices and in the Main app menu on Windows Mobile/CE. 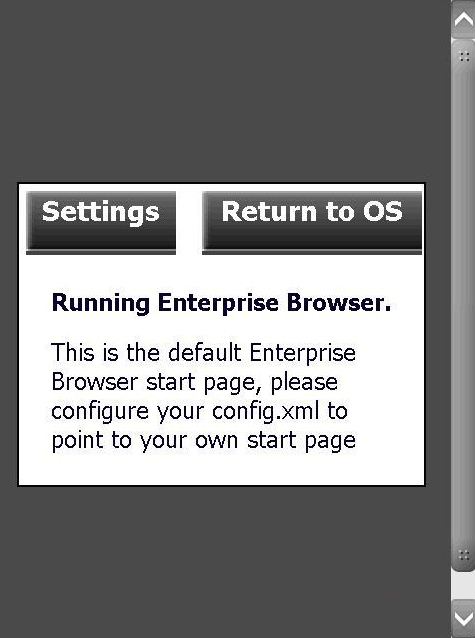 Versions prior to Enterprise Browser 1.5 launch with default runtime settings as defined in the Config.xml file on the device. Enterprise Browser 1.5 and higher can be launched with a pre-configured Config.xml file and optionally a pre-configured keycodemapping.xml file as well. See the Config.xml Reference guide for information about configuring the Config.xml file. Press the "Return to OS" button to skip settings configuration and bring up the operating system. To display the Settings button again, simply relaunch the Enterprise Browser app. To activate an EB app's start page, enter the URL in the Value field of the StartPage parameter, as highlighted above, but do not apply the changes yet. Applying changes immediately will cause the new start page to be displayed next time EB is launched and will remove access to the Settings panel. WARNING: Free-form text fields such as "username" and "password" can accept alpha-numeric characters only. Entering non-text characters (< > \ / " ') in these fields (except in a URL field) will corrupt the Config.xml file. 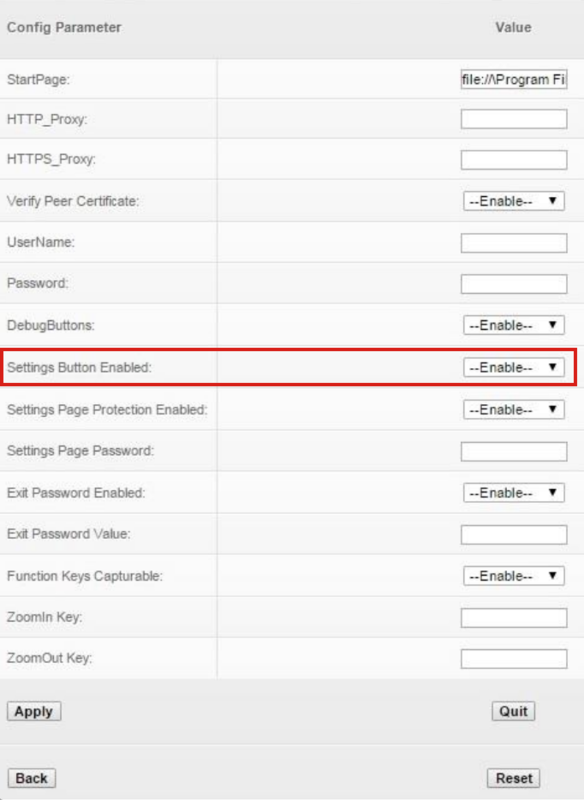 If on-device access to runtime settings is desired after setting up the start page (for example, to experiment with various settings before deployment), set the SettingsButtonEnabled parameter to "Enable" (as below). This will cause a Settings button to appear in the UI at all times. Passwords also can be set here, if desired. Press "Apply" to update the Config.xml file with the new settings. A screen like the one below will be displayed. Restart the app to activate the changes. The Settings button, if enabled, appears in the UI like the one in the red box below. Note: When the IE engine is used on a Windows CE device, displaying the Settings button in this way might cause screen distortion when scrolling. The on-device settings panel provides access to just a small subset of Enterprise Browser runtime settings. For access to all settings, please refer to the On-device Configuration guide.